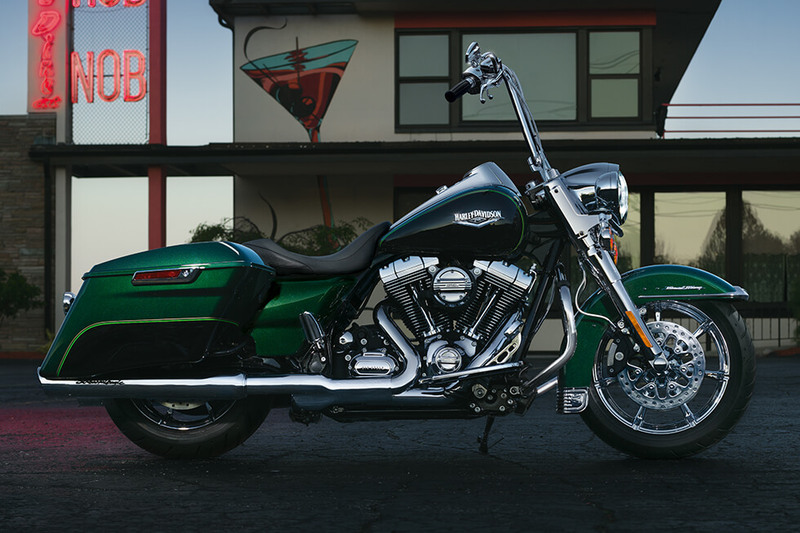 The 2016 Road King boasts undeniably classic styling along with the latest in touring motorcycle design to provide you with the long-haul ride you want. 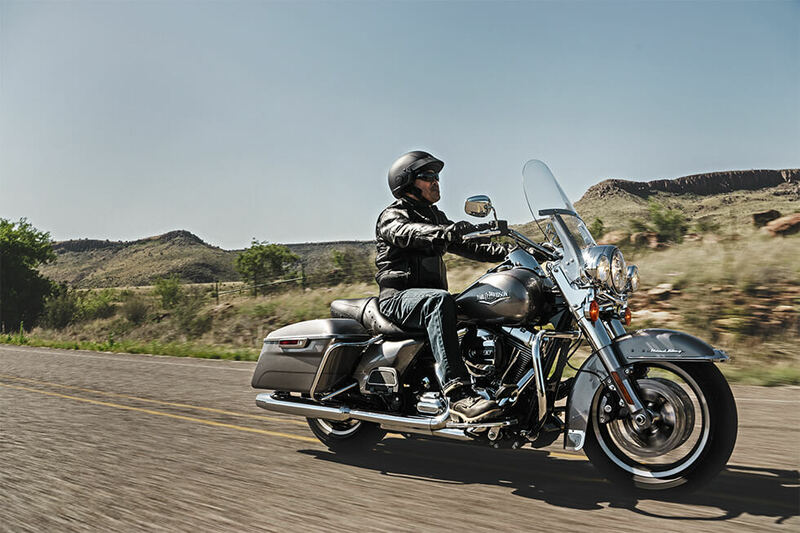 The Road King is the most affordable bike in the Harley-Davidson® touring lineup, so if you’re looking to hit the road in Overland Park or Lenexa, it’s a great place to start. 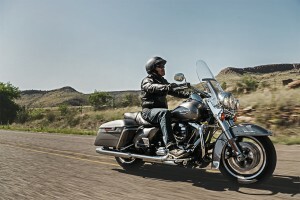 Find out all about the Road King here at Rawhide Harley-Davidson®. The Road King is classically styled for a sleek, stripped down look. 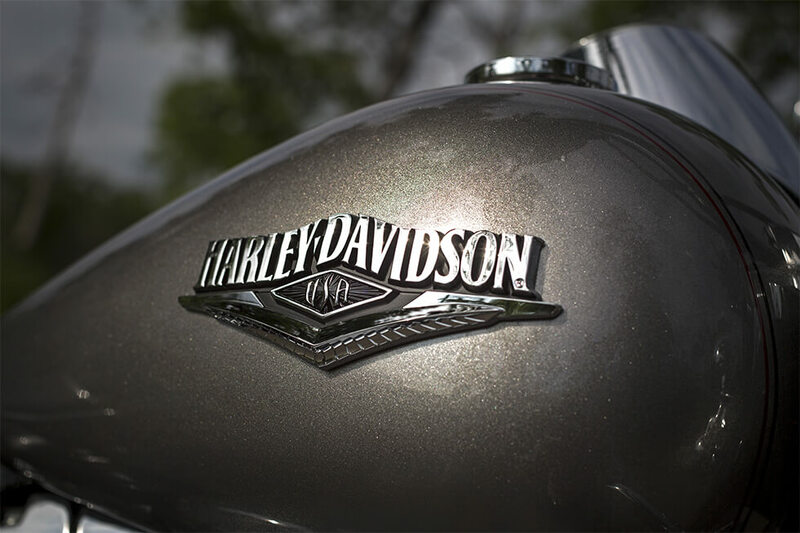 Our designers at Harley-Davidson® believe that a bike shouldn’t sacrifice power for style and convenience, and that’s why we’ve created a bike that offers both. Project RUSHMORE – Styling: Project RUSHMORE is all about providing the greatest touring features to create epic touring bikes. Every detail has been designed and tested to provide long haul comfort and convenience. Tank And Fender Badges: Signature tank and fender badges make sure everybody knows what you’re riding. These distinctive metal pieces set off the premium paint. Front Wheel: 17″ Impeller® Front Wheel: The 17-inch cast aluminum, 10-spoke Impeller wheel up front and the 16-inch Impeller rear wheel deliver the kind of style you want from a bike that can take you anywhere. Classic Hiawatha Headlamp: Recalling the Big Twins of the ’60s, this throwback headlamp delivers modern performance with enough illumination to light up even the darkest night. 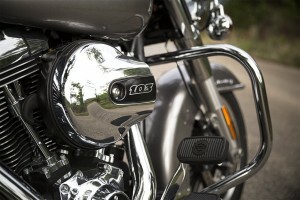 Tank Mounted Gauges: Up top of the tank you’ll find all the information you need about the Road King®. Your tachometer, gear indicator, speedo, and indicator lights, are all where you want them. Low Mounted License Plate: Keeping the rear end clean, the license plate is located low and is ringed by a set of LED lights for a classic look. 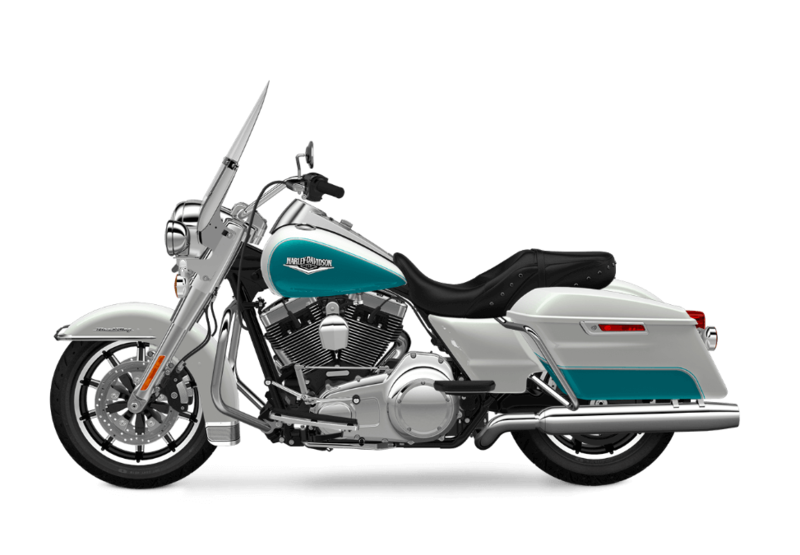 Classic Fuel Tank: A big six-gallon fuel tank doesn’t just provide more area for custom or premium paint, it gives you plenty of range between fill-ups, giving you the ability to ride longer. 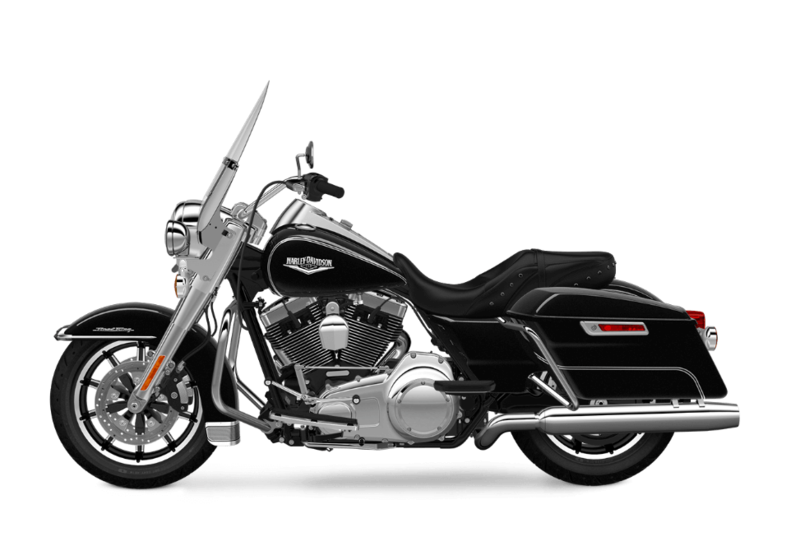 Pure Harley-Davidson Styling: Everything about this bike is bold and stylish, including the Twin Cam 103™ engine with black powder-coated heads and cylinders which are highlighted by machined cooling fin tips and chrome rocker covers. The Road King benefits from decades of Harley-Davidson® research into what makes the best possible bike for long, hard rides. Project Rushmore features make this a superior bike for the longest rides. Dunlop® Multi-Tread™ Tires: The Dunlop® Multi-Tread™ technology uses harder compounds at the center and softer ones on the sides for a tire that still knows how to knuckle down on corners. This helps provide the confidence that you want in any road conditions. High Output Twin Cam 103™ Engine: More power is something that everybody wants, and this V-Twin delivers. It also offers more reliability and durability thanks to electronic sequential fuel injection and lightweight alloy pistons that help dissipate heat. Dual Halogen Headlight and Fog Lamps: The Road King® gets dual halogen headlamp and halogen fog lamps to match a super bright 986 lumens of output, so you can light up the darkest roads. 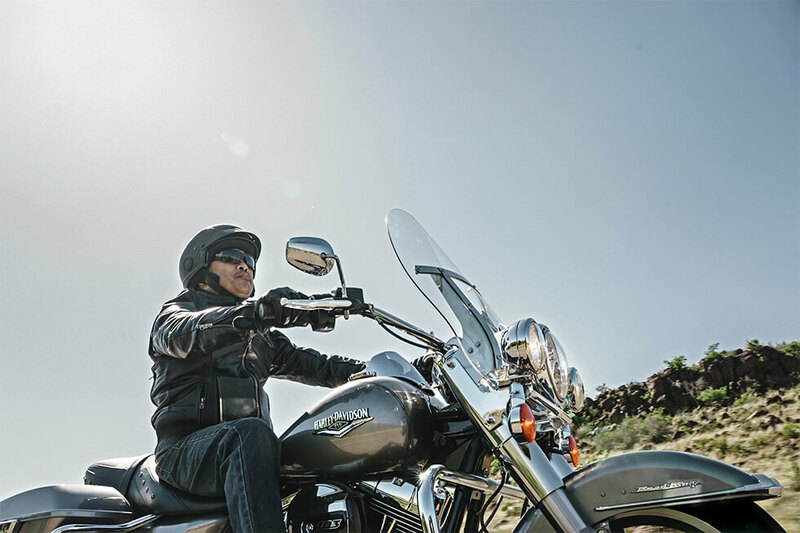 Steering Head and Front Forks: You want confidence up front when you’re loaded down with gear, and the Road King® delivers with its 49 mm fork legs. The added stiffness helps provide predictable handling and solid braking performance. Ergonomically designed hand controls: Contact points are one of the hardest parts to perfect, but we think we’ve done it with the Road King. Your hands fall naturally onto the handlebars, and from there you have access to throttle, brakes, and even controls for the infotainment functions. Air-Adjustable Suspension: Depending on your load you may end up adjusting your suspension quite a bit. 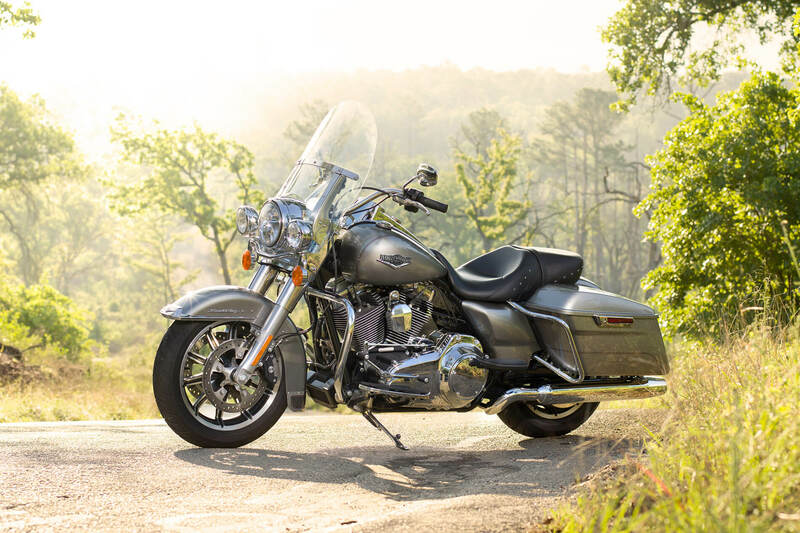 That’s why the Road King® makes it easy: Up the pressure for a firmer ride when carrying lots of gear, or let some air out for more cushion. Reflex™ Linked Brakes with Anti-lock Braking System (Optional): Your linked brakes help you slow down with confidence and control. Upgrade to the antilock brake system if you want to know you’re not going to lock the wheels on a slippery road surface. Six-Speed Cruise Drive® Transmission: This gearbox gives you the control you need over the big V-Twin. Low, close spaced gears let you get up to speed quick, and a tall top gear lets you cruise quietly at a low engine RPM that helps reduce fatigue. Brembo® Brakes: Brembo® is the top name in braking technology, and that’s why you find these powerful calipers on the Road King®. Big pistons provide plenty of grip and lower lever force. Twin Cam 103™ Engine Power: Contemporary technology like Electronic Sequential Port Fuel Injection gives you all the torque and horsepower you need to hit the road. It’s a breeze to pop into fifth gear and power past that big-rig on the freeway, even when you’re riding with a passenger and carrying your supplies. Twin Cam 103™ Engine Heritage: You might know some of the engines that came before this one. The Flathead, Knucklehead, Panhead, Shovelhead, Evolution®, Twin Cam 88®, and Twin Cam 96® all cut an imposing profile. It’s this heritage that went into the Twin Cam 103™, so you know you can trust it for mile after mile. 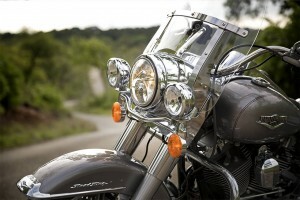 H-D® Smart Security System (Optional): When you park your bike after a long ride, do you want to have to worry about it? Of course not. 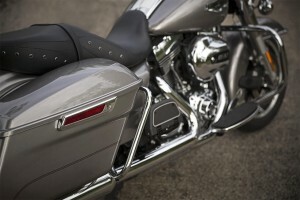 If you add on the H-D® Security System, you’ll have peace of mind that your bike is protected. Twin Cam 103™ Engine Innovation: Lightweight pistons provide smoother operation and improve efficiency. They also manage heat better, so you can expect better reliability. The same goes for Electronic Sequential Fuel Injection, which optimizes combustion for lower emissions and more power. The Road King is powered by the iconic Twin Cam 103™ V-Twin that cranks out all the muscle you’ll ever need. 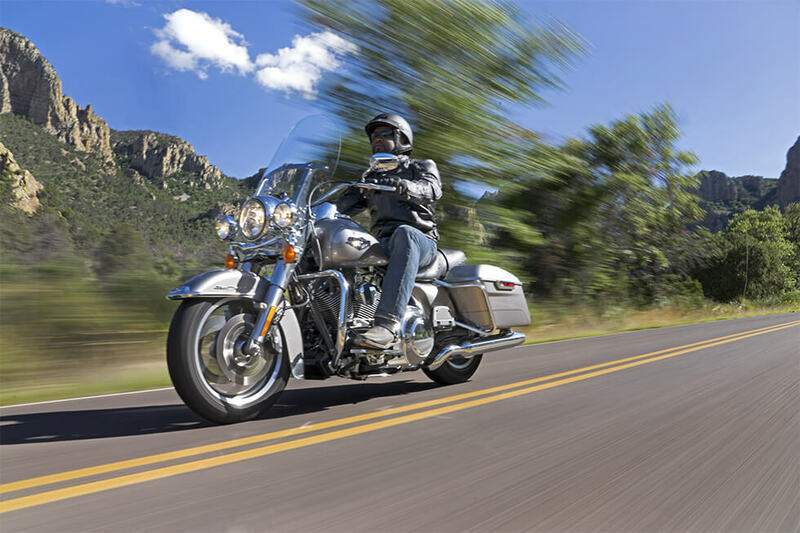 But all this power would be nothing without a comfortable, well designed ride, and our engineers have gone to great lengths to make sure the Road King is a great all-day bike. Project RUSHMORE Comfort: Long hours in the saddle are the only way to know how to design a bike, and our Harley-Davidson® designers and engineers have done their research. This bike is designed to keep you comfortable for the long haul. Two-Up Road King® Seat: With a sculpted bucket and back, this two-up seat provides comfort, support, and style for you and your passenger. It’s only 26.5 inches off the ground, so it’s easy to get on, get off and put your foot down, and the advanced ergonomics promise to keep you comfortable for mile after mile. Full-Length Footboards & Toe/Heel Gear Shifts: Tried-and-true full length foot boards include rubber isolation for a comfortable ride, while the height-adjustable passenger boards provide confidence for the passenger in back. Standard Cruise Control: We know that riding long stretches of highway can be tiring, and standard cruise control on all touring models helps alleviate your fatigue. 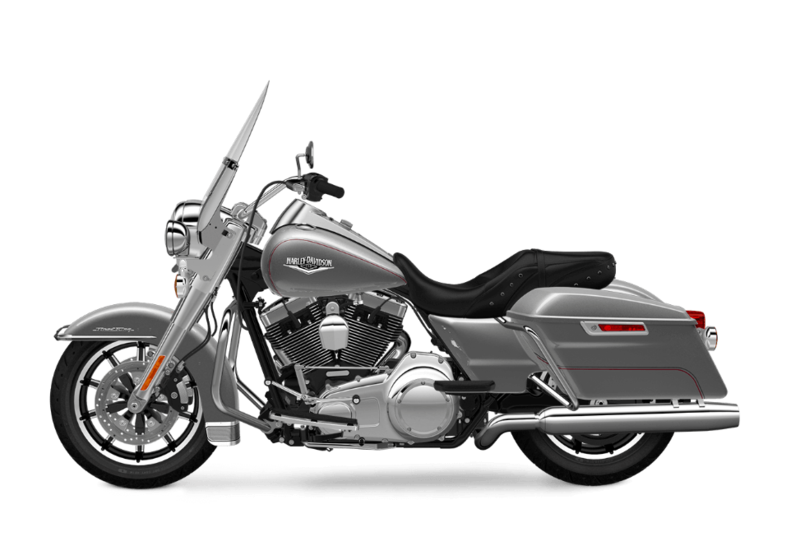 One-Touch Design Philosophy: Harley-Davidson® designed the Road King® so that everything opens with a touch of a button or one hand, all while wearing gloves. It’s that simple because it should be. Saddlebag Design: Simple one-touch hardshell saddlebags protect your gear but don’t stop you from accessing your stuff in a second. The lock is tight and integrated into the latch where you can slide the key in without the danger of scratching your premium paint. Project RUSHMORE – Convenience: The Road King® is designed with convenience in mind. 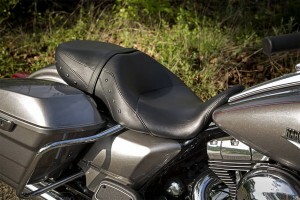 One touch saddlebags, a smartly designed infotainment system, and more all go into creating a convenient ride. 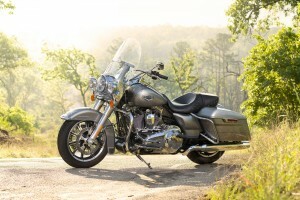 Wide Set Handlebar: The commanding, wide-set position the Road King® puts you in is ideal for devouring mile after mile. It’s comfortable and it puts you in complete control. H-D® Detachables™ Windshield: The windshield is easy to take off when you want to strip down the Road King® for more casual, carefree riding in and around town.